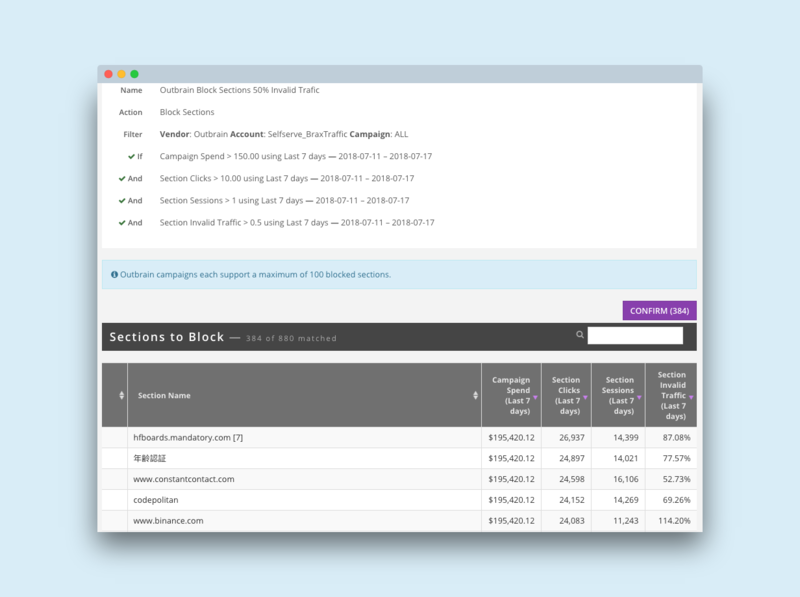 This is a guide that focuses on data-driven optimization of Outbrain campaigns. Several examples are provided; these are for illustration purposes only. There is a certain amount of “data discovery” that you will go through figuring out what your upper and lower limits on data before making an adjustment. The screen shots are from Brax; however, you can apply these in Outbrain Amplify - I just find it tedious and time consuming. There are two cardinal items that must be setup correctly for you to profit from native ads. 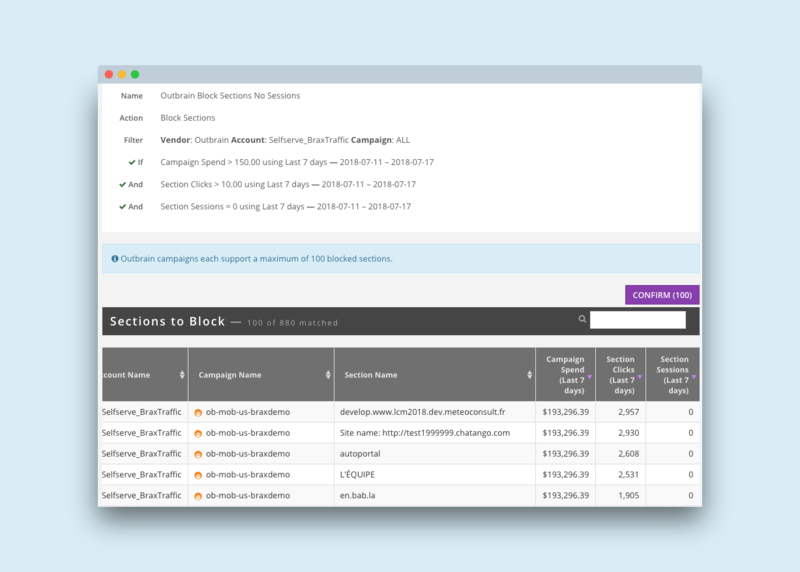 For more information see Outbrain campaign tracking guide and conversion setup. 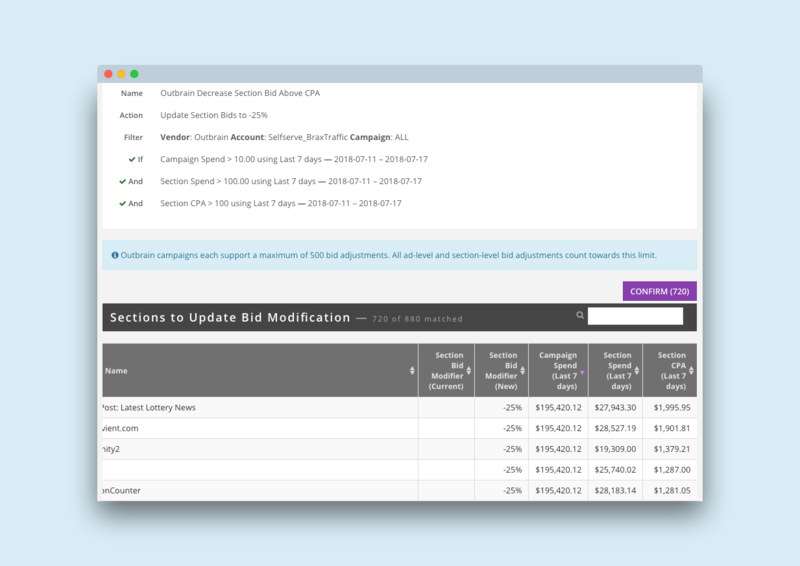 Fourth, these optimizations are at the section level, a specific area on a publisher website with Outbrain ads. Another important thing to remember is optimization rules break down into two components: action and conditions. The action is the change you want to make such as blocking a section or changing a section bid. The conditions is the criteria for the action to take place. Now that we have all that out of the way, onto the good stuff. I recommend using Google Analytics for this; even if you don’t use it for conversion tracking. 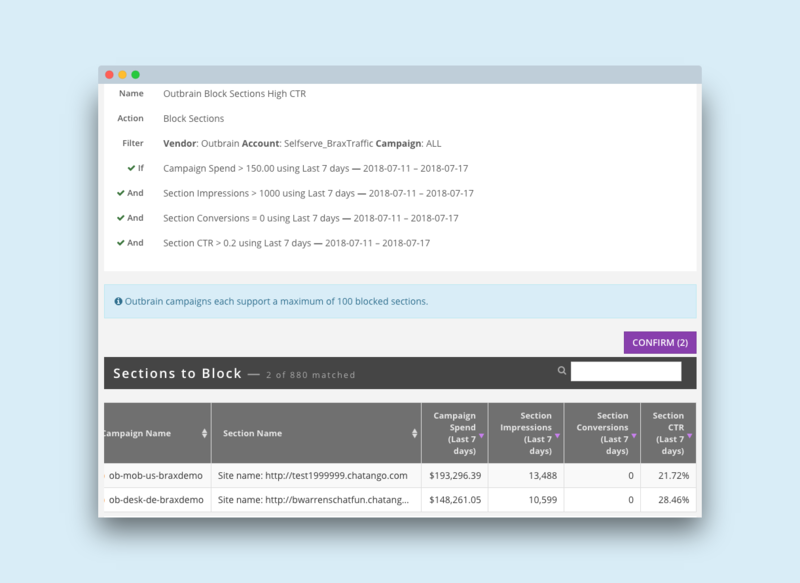 Another alternative is to use a click tracker (Voluum, Thrive, etc) and base it on clicks from the landing page to another page. This is often called LP CTR or landing page click thru rate. 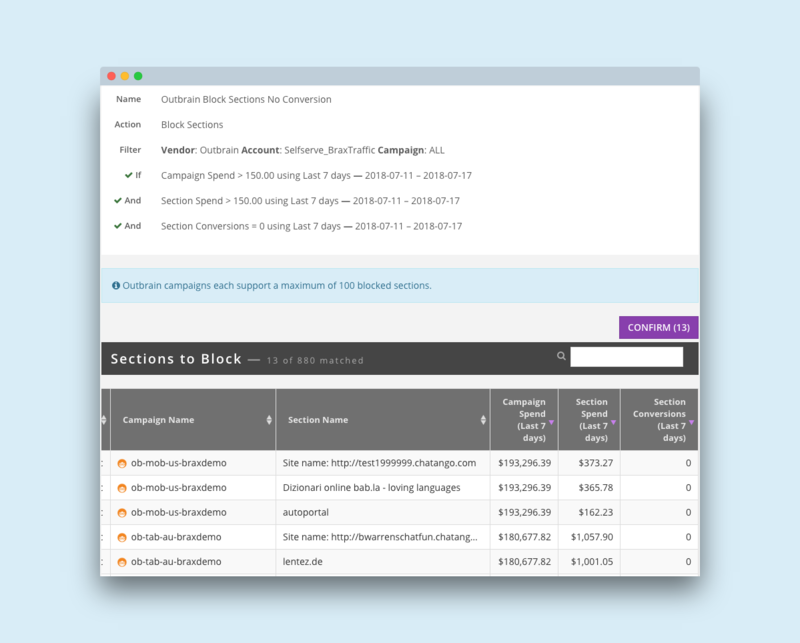 Before blocking a section completely, it is worth lowering the bid on it to see if that gets to the CPA goal. In this rule we are lowering the bid 25% after 2x the goal CPA is spent. You might also use multiple tiers (two rules) of this kind, such as, a 20% decrease after CPA goal spend, then a second rule to decrease another 20% after 2x CPA goal spend. This rule is aimed at getting more volume from a section that performs well by bidding slightly higher. The idea being you will be in a higher position on that publication which can subsequently increase CTR. 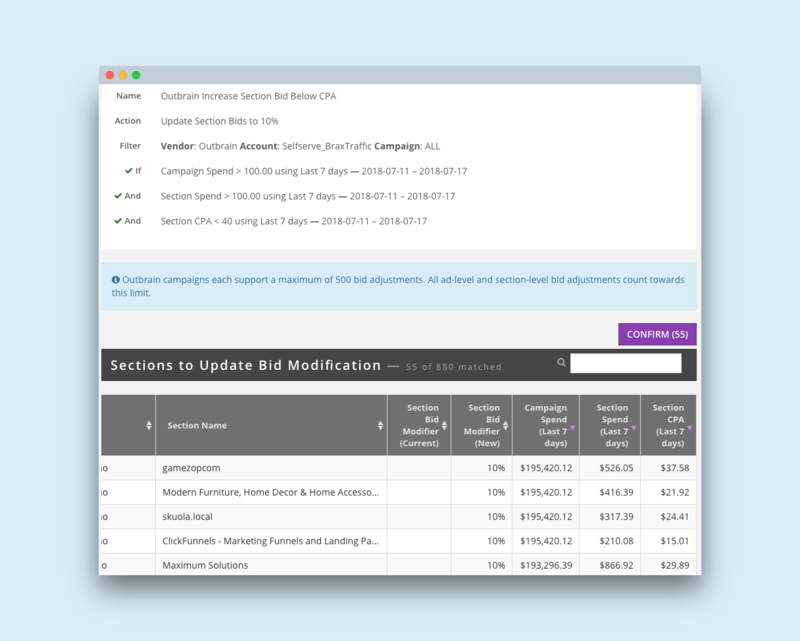 You want to exercise caution and increase the bid slowly so a profitable section does not turn upside down. Remember that Outbrain is an auction that aims to maximize the cost per thousand impressions (CPM) for each section. So if an ad creative has a high CTR on one section and not another then it will show more on the first section. This is why you may see a top spending ad that does not have the highest overall CTR, because other publisher sections with lower CTR drag it down. In addition, try looking back 60 or 90 days to see what shows up. Usually the best approach to optimization is to methodically go from manual to automated process. If you have not done the optimization manually yet, automating it will likely make a mess. "...automation applied to an efficient operation will magnify the efficiency... automation applied to an inefficient operation will magnify the inefficiency." At the same time, you need stop gaps in place to limit risk. Hopefully this guide will inspire you to put in place some stop gaps. Once you have defined, tested and trust rules then you are ready to automate. Here is a guide to automating rules.